This superb allegory has the two stars, Reese Witherspoon and the Tobey Maguire being placed into Maguire's favourite TV show Pleasantville, a product of 50's politeness and complete naivity. Of course, their 90's sensibility starts to rock this perfect world as the town folk of Pleasantville start to discover their own urges and desires and as they do, turn from black and white into colour. The racial allegory toward the end is perhaps laid on a bit thick, but I still found it to one of the most engaging films I've seen in a long time. To accompany his fable, director Gary Ross turned to Randy Newman who turned in one of his most engaging and charming efforts. The American values and their corruption are ideal material for Newman who's fragile Copland-esque scoring stands out in the film, while never becoming overbearing. There were only around 45 minutes of score in the film and the album covers the best parts of the score admirably. Newman manages to capture every nuance of the story in his score, from the setting to the emotion and the interesting approach of not using brass until most of the characters are in colour. 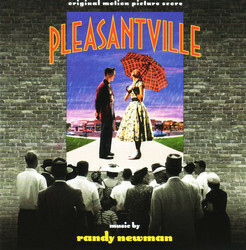 The Pleasantville theme itself is the theme for the TV show, but is also used and adapted throughout the score. All the music is bathed in the kind of gentle nostalgia that would be expected of Newman with echoes is previous efforts such as Awakenings and The Natural. Highlights include The Mural, which sounds like a warmer and richer version of Danny Elfman's farewell music from Edward Scissorhands. While this works well on disc, its effect in the film is incredible and brings across all the feeling the scene which contains almost no dialogue. Each track seems to blend perfectly well into the next, even though some of the cues are extremely short, the shortest being just 15 seconds. There are a few more active moments, such as Bud's a Hero, Burning the Books (which contains some trombone work worthy of Jerry Goldsmith) and Punch, but they do not break the mood of the score one iota. A New Day, which is the longest cue on the album sounds strangely like the finale, yet there are some more tracks to go, including a short burst of big band in Let's Go Bowling. No Newman fan should be without this score and while it does have quite a few stylistic similarities to Newman's previous scores as mentioned, it does still stand out against the blandness of similar intimate drama scores and proving again that with the right film, Newman can write music shot with emotion and style. It was sadly passed up for the Academy Award and would certainly have been my pick. While there were better scores in purely musical terms, Pleasantville worked the most noticeably and conjured up the film more vividly than any of the other entries. However, I am sure with more efforts like this, Randy will be up collecting his statue before too long. 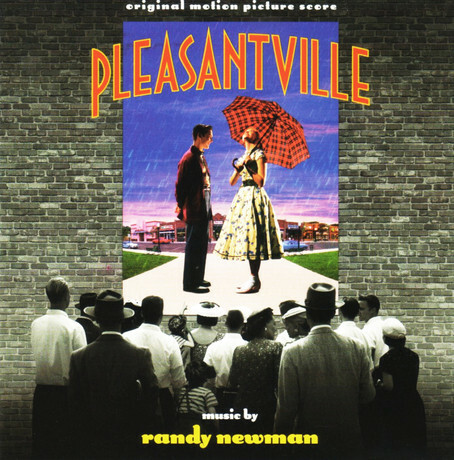 For Pleasantville Randy Newman has composed a wonderful score, filled with warmth, joy, suspense, nostalgia making it one of the most enjoyable listening experiences of 1998. Almost every track is a highlight, all filled with wonderful themes, but especially memorable cues are "Bud's a Hero", with punchy brass playing, and clever clarinet solos, sometimes very classical sounding; "Mural", which is very reminiscent of Danny Elfman's music for Edward Scissorhands (Maybe that part of the film was temp tracked with Elfman's score) - but we are not talking about a rip-off here. They just share the same warm and cozy sound. And "Mural" is easily the best track on the entire soundtrack. Then there's "Burning the Books", which really is in contrast with the rest of the score, with its dramatic brass and snare drums. "Let's Go Bowling" is wonderful jazzy cue with piano, trumpet, choir (singing "la la la" - very catchy!) and percussion, and with a theme that's bound to get stuck in your mind. OK, on with the more negative criticism. Some of the tracks are ridiculously short. "The Sweater" for example is just 15 seconds. I mean, what's the point!? And, as Pleasantville is released by Varèse Sarabande, I should warn you that the CD is rather short - just over 30 minutes. But that is some splendid 30 minutes of music! And if you haven't seen the film, I suggest you do so.